PDS 2003 Excel Password Recovery software quickly works on your locked Excel file & smoothly recover Excel 2003 password.PDS Excel 2003 file password recovery software quickly recover password Excel 2003 file. Through Excel 2003 sheet password recovery software you can recover sheet Excel 2003. 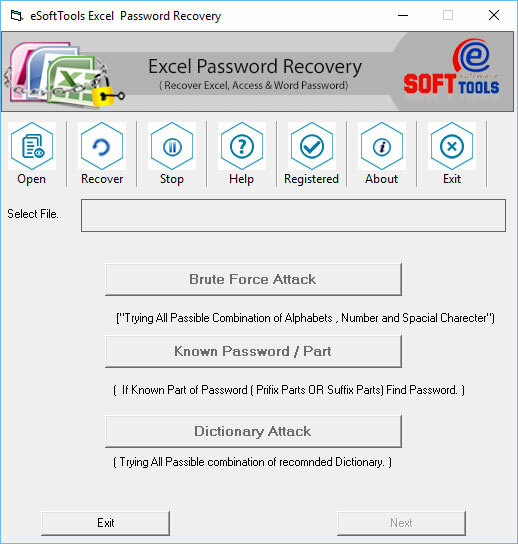 2003 Excel password recovery software easily recover lost Excel Password by using Dictionary Attack, Brute Force Attack. PDS 2003 Excel Password Remover software quickly works on your locked Excel file and recover lost or forgotten Excel Password. With the help of Excel 2003 sheet password recover software you can remove sheet Excel 2003. PDS 2003 Excel password recovery remove Excel 2003 password by using its brilliant method- Dictionary Attack, Brute Force Attack.2003 Excel Password Remover tool work on Excel versions-97/2000/2002/2003/2007/2010/2013/2016. Perfectdatasolutions team introduced quick excel password recovery software to recover excel 2007 password or remove 2007 excel protection in least time. This 2007 Excel Password Recovery tool is perfect solution for your lost or forgotten excel file password recovery. PDS Excel 2007 Password Remover safely remove excel password from such MS Excel file versions including-2010/2007/2003/XP/2000/97and get your excel file with all original data. 2007 Excel Unlocker and unlock excel 2007 program can safely recover excel 2007 password. In oftentimes many quarries create in your mind related to 2007 excel password and need to unlock excel file 2007, but you don?t worry about this because PDS 2007 Excel password recovery software easily solve out your requirements and queries. XLSX unlocker tool save and fast works on MS Excel versions -2016 - 97. Simply build up emails with 2010 OST to PST Converter software on off-line for Outlook email client. If Exchange Server down by any issue related with Hardware or Software then use 2010 .OST to .PST Converter software to straightforwardly restore OST files from client machine and convert OST to PST and access emails with MS Outlook client mailbox account.